Most of my pictures on this website comes from five national parks. All the parks have different environments and organization and therefore different benefits. Most of my information on the animals is gathered from the book "Larger Mammals of Africa" by J. Dorst and P. Dandelot. 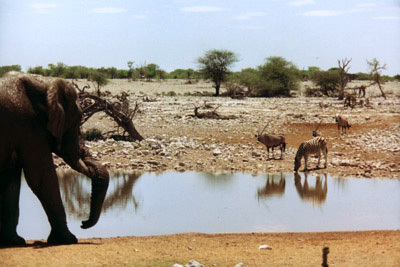 Etosha National Park lies in the northern Namibia. It's a quite modern park and very well organized. The nature consists mainly of open plains and bush lands. At the time for my stay, in November, it was quite dry and not a lot of animals around. There are three nice resorts placed evenly over the park were you spend to nights. These resorts has got nearby waterholes where you easily can sit and watch the animal drinking and socializing. It's really a brilliant idea. During daytime you can drive across the park on very well kept roads. Three days in Etosha is a minimum. The park is located at the city of Victoria Falls at the Zambezi river in the northern Zimbabwe, close to the Zambian border. It's a very small park, mainly consisting of light bush land. Some animal migrate through this area and occasionally you find elephants and even lions here. A lot of animal were gone at this time of year (in early December), as it was hot and dry. Being close to the Zambezi river you can always find Hippos and Crocs though, so watch out. Horse riding through the area is recommended as the animals don't cares about you, as long as you sit on the horses back. You only need half a day to cover the area. 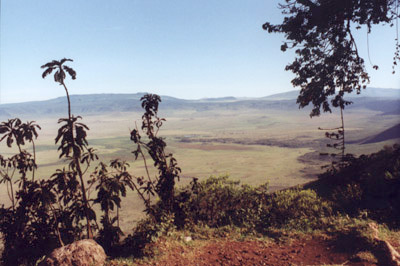 Ngorongoro lies in the Serengeti area in northern Tanzania. It's a volcanic highland and the actual safari park consists of an huge crater, the biggest crater outside of Asia. The bottom of the calderas is a wide open plain on the altitude of 1700 meters. There is a lot of animals here. Antelopes, carnivores, elephants, and in the middle there is a pond with hippos and a lot of birds. Besides, the animals are easy to spot as the field is open. Some animals are trapped here by the natural walls and some comes here because they like the local climate. Old elephant come here when their teeth is getting bad, because here the the grass is always green and soft. You could cover the area in one day, but you need a 4WD and a driver. There are resorts and hotel outside the conservation area. Very expensive though. 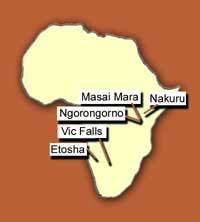 The "Mara" is close to the Serengeti area but on the Kenyan side of the border. It's a huge park, not very easy to survey. The roads are badly kept and very bumpy, so you need a 4WD and a good driver. But it has a natural environment and you can find what ever you are looking for, is you only got the time. 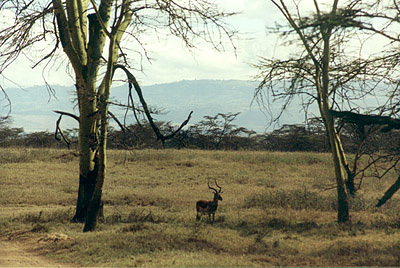 The area consists mainly of open grassland or bush land. 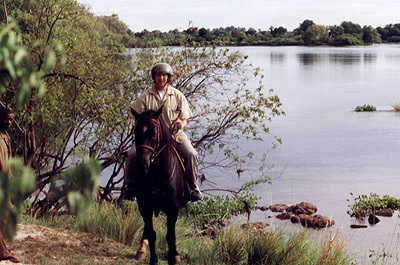 The prime times for safari tours are ether in spring or autumn when a lot of animals migrates. As the name suggest, the park is run by the legendary Maasai people who lives their traditional life here and you find several of their settlements outside of the park. Nakuro (aka Nakuru) is a small private park, mostly known for it's famous salt lake with thousands of flamingos. 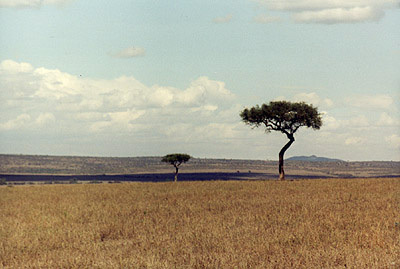 The park holds a nice mixture of forests, hills and open plains. All the photos on this website were taken with 2 old Olympus-cameras from the 80th, one OM-40 and one OM-2. I used to prefer the Om40 but there is really no big difference between them. The OM40 though, didn't survive the heat in Africa and some plastic details simply melted away in the Namibian desert, which ruined at least 10 rolls of film before I realized it. The lenses I used was either a 80-200mm zoom or a 500mm with mirror-lenses. The later is quite heavy and needs a lot of light. This also ruined a lot of pictures which become unfocused or blurry. On the other hand, a 500mm lens is wonderful to have if you want to get close up animal shots. I used exclusively negative film, mostly fast ones, 200-400 ASA, as the big lens needed a lot of light, even with the African sun. Overall my equipment was not very professional but still quite efficient for my needs. Back home I used a negative-scanner to digitalize the pictures (a never ending work). I then edited them slightly in the computer using Adobe Photoshop, meaning removing scratches and dust and enhance the contrast and light. Off course, no cutting or pasting of the motives was made.